CHICAGO — On a crisp, clear Sunday afternoon, 43 Nikkei veterans of the “Good War” received heartfelt thanks from their community for defending the country that had questioned their loyalty and had put many of their families in detention camps. 442nd RCT veteran ENOCH KANAYA receives his personalized handmade quilt from Quilts of Honor Director Gail Belmont. The occasion was the Nikkei World War II Veterans Tribute. It was 67 years after the war, but the smiles and damp eyes told the story of pride and appreciation from almost 500 family and friends. The event took place April 22 at the International Union of Operating Engineers Local 399. 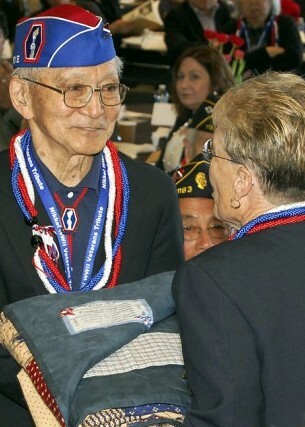 Last November, the prestigious Congressional Gold Medal was awarded to veterans that served in three segregated Army units — the 100th Infantry Battalion, the 442nd Regimental Combat Team, and the Military Intelligence Service. Many others who also served in World War II were ineligible for this award but no less deserving, and the tribute recognized their contributions. The tribute included all Japanese American World War II veterans, male or female, who entered military service by Dec. 31, 1946. Organizers identified 718 living and deceased veterans with ties to the Midwest, and invited all of the veterans or surviving family members who could be located. Although 46 veterans were to be honored in person, three were not well enough to attend. The tribute was a great time for hugging, back-slapping and getting reacquainted with old friends. While the Na Kupuna Ukulele Club provided pre-program entertainment, the veterans were presented with hand-made fabric leis donated by Hawaiian Nisei ladies. After a screening of “Gaman: Portraits of World War II Nisei Veterans,” a short video produced especially for the tribute by Daniel Izui, U.S. Rep. Jan Schakowsky (D-Ill.) of the 9th Congressional District and Maj. Gen. (retired) James H. Mukoyama Jr. reminded everyone of the good these men and women contributed to U.S. history and the Japanese American community. Mukoyama is also part of that history. During his more than 30 years of active and reserve component service in the Army, he was a platoon leader in the demilitarized zone in the Republic of Korea, an infantry company commander in the 9th Division in Vietnam, and the first Asian American to command an Army division. His decorations include the Distinguished Service Medal, the Silver Star, the Legion of Merit, three Bronze Stars, and the Purple Heart. For the VA, he chaired the Advisory Committee on Minority Veterans. One moving portion of the program was the presentation of a personalized handmade quilt to each veteran by Quilts of Honor, an organization that is dedicated “to bestowing a universal symbol and token of thanks, solace, and remembrance to those who serve in harm’s way to protect and defend our lives and freedoms.” The group’s director, Gail Belmont, took part in the ceremony. The honorees also received a resolution from the Illinois House of Representatives. The presentation of colors was carried out by the Chicago Army Recruiting Company Color Guard. The national anthem and “God Bless America” were sung by Bruce Mattey, co-writer of the hit ballad “I Will Always Think About You” for Chicago’s own New Colony Six. He and the band were inducted into the Iowa Rock and Roll Hall of Fame for their contributions to Chicago’s musical landscape. The tribute was co-sponsored by the Chicago Nisei Post 1183 of the American Legion, the Chicago Japanese American Council, the Chicago Chapter of the Japanese American Citizens League, the Chicago Japanese American Historical Society, the Japanese American Service Committee, and the Tom Arai Bequest of the Japanese American Mutual Aid Society of Chicago.